in less than a day! Cheltenham Dental Spa & Implant Clinic has the technology to make this happen in 1 day and with no dental impressions! Whether you need a dental implant, smile makeover, inlay or crown we make this possible for you in just one visit. This is because Cheltenham Dental Spa has the technology at its finger tips - a Dental Radiography Studio, Dental Laboratory and Treatment Centre all under one roof. No dental impressions needed either. So no lengthy referral appointments or long waiting periods between treatments. 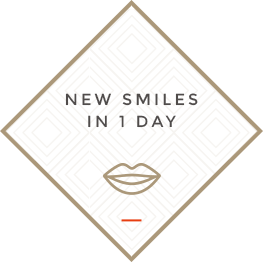 We can create a stunning smile for you at short notice - in time for that important event! How is it possible to achieve same day dental treatment? Smile-in-A-Day requires leading-edge technology, a sophisticated laboratory and a team of skilled professionals which we have! This means we can design, make and implement a range of cosmetic elements for you, right here in our clinic. By investing in the latest technology and methods, means a winning combination of the best cosmetic dental solutions without compromise. Where we take 360° x-rays of your skull, jaw and teeth for re-aligning your bite. Precise digital measurements and dimensions leaving no room for human error. We have our own experienced Lab Technician, materials and expertise right here . Dental Treatments that normally take weeks, including Dental Implants, are completed in a single visit.